LONDON, England (CNN) -- The Bank of England bought £2 billion ($2.8 billion) of government bonds Wednesday as the UK introduced quantitative easing to kickstart the ailing economy. The move comes after the bank cut interest rates from one percent to 0.5 percent last week -- a drop of five percent since October last year and the lowest in the bank's 315-year history. 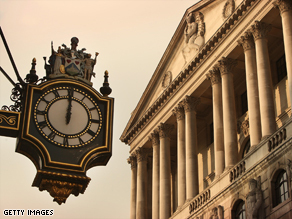 Central banks worldwide including the Bank of England have tried to encourage spending and lending during the current downturn by cutting interest rates -- with limited success. Rates can now not fall much further -- hence, the Bank of England believes, the need for another strategy. Instead the Bank of England will "create" more money on its balance sheet, then use this to buy banks' assets such as home loans and government bonds, thereby pumping extra cash into the system. The banks all have accounts with the Bank of England, and the money will simply be credited to those accounts. The creation of more funds will be done electronically. The Bank's Monetary Policy Committee, which determines strategy, has the authority to create up to £150 billion ($207 billion) on the balance sheet, although it has said it will only inject £75 billion ($105 billion) over the next three months -- or £5 billion ($6.9 billion) per week. The first chunk is being used to buy government gilts, the UK's Press Association reported, at twice-weekly auctions. Quantitative easing was last introduced in a major economy in Japan from 2001 until 2006. The economy recovered, although expert opinion is divided as to whether quantitative easing helped with anything other than improving sentiment among consumers and business.